The San Francisco Bay Area has long been synonymous with scenic sophistication – offering breathtaking views in every direction. There’s nothing like taking in a glorious sunset from the comfort of home, and our motorized shading products allow homeowners to enjoy the view while providing privacy, comfort, and UV protection. European Rolling Shutters offers several exterior shading products including retractable awnings, voss awnings, exterior roll shutters, retractable solar screens, and retractable pergola covers to conveniently protect your family, home, and business from sun damage. As a Somfy Platinum Expert authorized dealer, all of our products are controlled centralized automation from Somfy. With Somfy automatic shade motors and controls, you can control your ERS motorized awnings, pergola covers, shutters and screens with the touch of a button on Somfy’s myLink® app, remote or wall switch. Somfy awning, shutter and screen motors and controls empower home and business owners to adjust ERS shading products from multiple locations with ease. 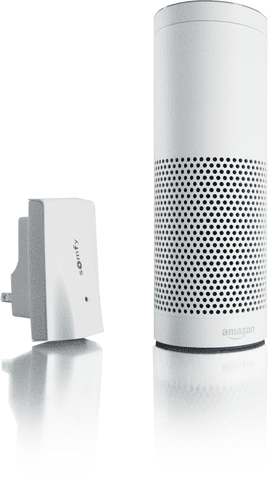 Much like a garage door opener, the handheld universal remote control or wireless wall switch operates shading products installed with Somfy motors located within their approximate 65 foot range. In addition, the controls can be operated without the need to point at the shading motors due to the omnidirectional nature of the technology. This solution, known as Radio Technology Somfy® (RTS), completely eliminates the need for wiring between the shade motors and controls, providing a convenient and reliable solution for shading automation. Somfy RTS controls are available as either single channel or multi-channel to enhance the organization of your motorized shading products. While a single channel RTS remote operates either one individual or one group of motorized shading products, a multi-channel remote permits full control of multiple individual and/or groups of shading products. For instance, the multi-channel feature allows homeowners to extend awnings on one side of their home while rolling up solar screens on the other side, all with the convenience of a single remote control and without the need to go to each side of the home. With the maximum number of 16 channels available with the Telis 16 RTS remote, it’s never been easier to centralize your automatic shading control! All RTS motors and controls are designed to be compatible with one another to provide a seamless automation system for your shading products. This feature allows you to use and combine any Somfy automatic controls according to your own preference. The Somfy remote control doesn’t require users to point or aim the transmitter, since RTS uses radio waves that can easily travel through walls. This allows you to roll down the solar screen in the living room while staying in your bedroom or extend your pergola cover without stepping a foot outside. 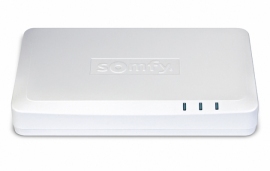 The Somfy wireless wall switch provides a convenient method to operate motorized products when entering or exiting a room. These battery-powered units don’t require any electrical work and can be installed in seconds. Smartphone and tablet users can install the Somfy myLink® app to transform their device into a sophisticated remote control capable of operating motorized products from any location. Homeowners who arrive at work – only to realize they forgot to retract their shades for the day – can operate all of them with a simple tap of the app. The phone/tablet can be used to operate any unit from one device anywhere, anytime while at home also. The MyLink has several built in timers that eliminate the need for stand-alone timers. With the Somfy timer, you can schedule any shading to extend or retract per day – with different weekday and weekend schedules. Schedules can automatically activate motors at any time of the day or on any day of the week. While default times are preprogrammed at the factory, the automatic operation of motorized applications can be programmed or changed quickly and easily with the press of a button. Manual mode allows users to override the programmed settings at any time. Automatic weather sensors, also from Somfy, can protect your shading products from wind, rain and sun damage. Installed weather sensors utilize RTS technology to automatically retract awnings, solar screens, and pergola covers during extreme weather. For example, with the Eolis 3D awning wind sensor installed on a modern awning, Somfy awning motors can automatically retract the awning via RTS as the sensor detects strong winds to protect them from damage. One of the features of the Somfy platform is the ability to program your favorite shading preference with Somfy’s “my” function. For example, instead of completely extending or retracting an awning, you can program it to extend only 40%, 50% or 60%. With the variety of Somfy controls and the versatility of the “my” function, the customization power is all yours. We’ve been manufacturing and installing our shading products in the SF Bay Area since 1983. We offer shading solutions from retractable awnings to rolling shutters, solar screens, and pergola covers. Powered by Somfy motors with versatile control options, ERS shading products can offer any home or business increased comfort, privacy, energy savings, and exceptional convenience. To learn more about the benefits of ERS motorized shading products powered by Somfy automation and get a free in-home estimate, simply contact us or call (408) 629-3740. Our factory is in San Jose, California, but we service all of the Bay Area from Marin to Monterey.